Maybe you have noticed all the hoopla over plastic microbeads lately. Recently, the media has clued into the fact that these microbeads are an environmental disaster and, as a result, are being banned. So long to (some of) the useless plastics in our waterways! Hoooray! But it is very possible you are completely heartbroken that your favourite facial and/or body scrub is slated to be discontinued. What ever will you do?! Well, just make your own, of course. No, you do not have to be some fancy bio-chemist. Or have access to a high-tech lab. You can make your own invigorating, exfoliating scrub easily with just a couple simple household ingredients! 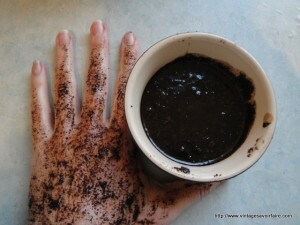 Just mix together coffee grounds and oil. Just brew up some coffee like usual and then save the old grounds. Let the grounds dry out and then mix in the oil. The measurements are just a guideline. Really, you should add oil until you feel the consistency is right. You are looking for something akin to thick mud. With finely ground coffee bits in it. But if you have sensitive skin, use just a teeny bit of oil. Not a whole quarter cup. Mix the ingredients together thoroughly. After you’ve washed your face and/or bod, massage the scrub on your wet skin in circular motion and rinse well with cool water. Very, very, very well. Affordable! It costs practically nothing. I would say “only pennies!” but we don’t have pennies anymore…. so…. Simple! You can mix 2 (or even 3) things together, right? Environmentally friendly! No plastic microbeads, no SLS, no chemicals, no dyes, no junk, no chemicals, no additives, no waste. Three cheers for the reuse part of our ReduceReuseRecycle mantra. Naturally deodorizing! It is actually a-ok to wash this down your pipes. It will help clear and deodorize your drain. Plus, it won’t wash a billion teeny pieces of plastic into our water system like your jerky old scrub does. Moisturizing! All that oil will make your skin super soft. Versatile! You can use this scrub on both your face and body. You can’t say that about the Laura Mercier Flawless Skin Face Polish, which is only for faces AND contains plastic microbeads. Like many many many crummy store bought scrubs. Vegan! Compostable, and cruelty-free. I promise. Just check out the ingredients list in Appendix A*. It can also be organic, fair-trade, and a whole host of other fancy sounding things (depending on the type of coffee you use). Messy! Please use this scrub in the shower, not at the sink. Also wash your shower out afterwards, so the coffee doesn’t leave stains. Aromatic! It smells like tasty coffee, and you will too afterwards! And yes, you can absorb caffeine through the skin. So it is possible that this scrub will increase your daily intake of caffeine. But, seriously? I highly doubt you will absorb an amount that would have any sort of significant result. All right, if you are deathly sensitive to the possibility of coming into contact with caffeine, don’t try this scrub. Otherwise, DO try this scrub. And enjoy your fancy supermodel skin! This entry was posted in recipes, self help, tips and tagged acne, affordable, alternative, beauty, caffeine, cellulite, cheap, coffee, complexion, cruelty-free, DIY, easy, eco-friendly, environmental, exfoliate, exfoliation, free, grinds, grounds, home, mircobeads, olive oil, reuse, scrub, self, simple, soft, sugar, treatment, treatments, use, used, vegan. Bookmark the permalink. I’ll have to wait until you get here and make coffee!